The Philadelphia Flyers announced that they have re-signed 6’1”, 210-pound left wing Riley Cote and 6’2”, 225-pound left wing Boyd Kane each to a new contract, according to club General Manager Paul Holmgren. Cote signed a new one-year contract, while Kane signed a new two-year contract. Per club policy, financial terms were not disclosed. “Riley is in his third season with the Flyers organization and he continues to improve,” said Holmgren in making the announcement. “We look forward to Riley having a good year for us. Cote, 25, was scoreless with 11 penalty minutes in eight games for the Flyers last season. He posted five points (1G,4A) and 125 penalty minutes in 37 games for the Flyers’ American Hockey League affiliate, the Philadelphia Phantoms. He was third on the Phantoms in penalty minutes with 125. In three seasons with the Phantoms (2004-05 through 2006-07), Cote has recorded eight goals and 12 assists for 20 points and 664 penalty minutes in 168 regular season games. A native of Winnipeg, Manitoba, Cote was signed as a free agent by the Flyers on August 23, 2004. Kane, 29, posted two assists and 28 penalty minutes in 15 games for the Flyers last season. In 57 games for the Phantoms, Kane recorded 10 goals and 22 assists for 32 points and 98 penalty minutes. He was signed as a free agent by the Flyers on July 13, 2006. In 27 career regular season games over three NHL seasons with the Flyers (2003-04 and 2006-07) and Washington Capitals (2005-06), Kane has registered three assists and 37 penalty minutes. Over parts of the last nine seasons (1998-99 through 2006-07), Kane has recorded 122 goals and 192 assists for 314 points and 1,170 penalty minutes in 633 professional games. In 532 career AHL games for Hartford, Springfield, Hershey and Philadelphia, he has registered 98 goals and 154 assists for 252 points and 999 penalty minutes. He has been a member of two Calder Cup Championship teams, as he was the captain of the Phantoms’ Calder Cup Championship team in 2005 and was a member of the Hershey Bears’ Calder Cup Championship team in 2006. A native of Swift Current, Saskatchewan, Kane has played three seasons for the Phantoms (2003-04, 2004-05 and 2006-07), recording 91 points (32G,59A) and 387 penalty minutes in 188 regular season games. 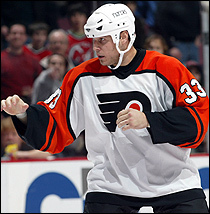 Kane was originally signed as a free agent by the Flyers on July 14, 2003.